Obviously we pick one of the wettest days of the year to do our “admin” – defined in our household as mind-numbing tasks that are not related to eating, swimming, playing/watching cricket, cycling or going for a nice long walk. Our “admin” yesterday saw us trudging in the pouring rain through Oldstreet, Tottenham Court Road and Camden Town where the son told us he would pass out if he wasn’t fed. A quick snack at Greggs (where we joined the police in trying to chuck out “Lorrainne” a homeless addict who seemed to have taken up residence in the joint) and I insisted that we were going on a biryaniquest to Parkway to look up a restaurant called Namaaste. The husband and son put on their resigned “we are supporting you in every step of the quest” expressions and we found ourselves reading the menu outside the restaurant. The chicken biryani was for £14 and I suddenly came over all principled and said that what I wanted was some affordable everyday biryani that the family and our friends could have often. £14 does not fall into that bracket for me unfortunately. The husband called in reinforcements and spoke to his friend who lives locally and eats in Namaaste quite often – the friend confirmed that the food was very good but agreed that the biryani was probably overpriced for the quality. What’s more – he’s eaten it and will kindly do a review. So that was that. We had no choice but to go to the Stables Market to stake out the food stalls there and having walked very quickly through myriad joints with gaudy red chicken tikka and butter chicken we came across a Sikh man smiling amicably at us behind a range of vegetarian dishes. In about five minutes of rapid-fire conversation in Hindi he told me his life story and we became friends for life – in fact at one point I referred to him as “older brother” and got a shy smile in return. I explained the quest to him and he was apologetic about the lack of vegetarian biryani on his “pure veg” menu but said that he could rustle up something for me and sure enough we were given a aubergine and potato curry layered with rice and topped with onions and coriander like this. We also ordered some parathas and a portion of Aloo Methi. Simply delicious and very affordable – all of the above cost £9. Verdict: Lovely owner, great food and we will go again to try out their other stuff. You should go too! Next time you are in Stables Market and looking for some nourishment, hunt out Radhe’s Pure Veg. You won’t be disappointed and might even make a new friend. 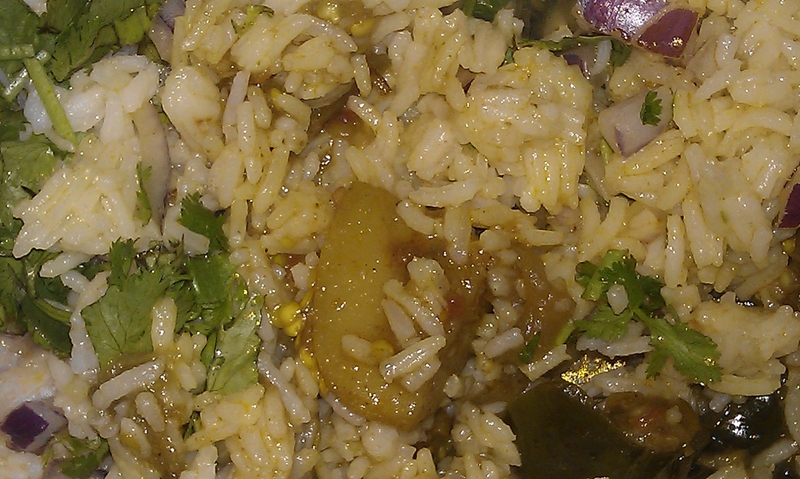 This entry was posted in Biryani and tagged biryani, camden, camden indian food stalls, Camden stables market, Indian food, indian potatoes, Indian takeaway, Indian takeway, Indian vegetables, veg biryani by Poornima. Bookmark the permalink.